It is well known the global community is looking towards business to play its role in creating a just and fair economy. This increases the urgency and relevance of new approaches to management education that can engage and foster socially responsible leaders who are resilient, creative and innovative thinkers. Educating for Responsible Management profiles cutting-edge approaches to pedagogy for the Principles for Responsible Management Education (PRME) that go beyond current discussions of sustainability and corporate social responsibility content, to include a wider lens that highlights the processes of educating the next generation of responsible managers. The book draws together leading thinkers, practitioners and management education to share their practice and research on how management educators can prepare themselves, their students, the learning environment, and their teaching resources to meet these challenges. These conversations across practice lines highlight a range of innovative pedagogical approaches and methods used by responsible management educators around the world to provide effective learning experiences. "In an effort to transform management education, the understanding of transformative approaches is imperative. 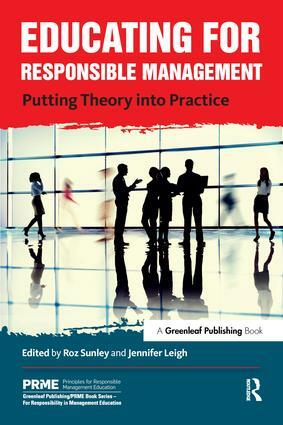 Demonstrated through original and collaborative content, from a vast array of practitioners and thought leaders around the world, this book provides innovative approaches to RME [responsible management education] that are easily relatable. It is a must-read for all individuals who are interested in shaping the business of tomorrow."